Happy New Year everyone!!! I hope you had a great Christmas/holiday period, and are feeling rested, relaxed and inspired for the year ahead. I'm feeling very excited about all the things I'm planning to achieve in 2019, so let me start by getting back on track with my monthly review of a free sewing pattern. I haven't tested a kids' pattern in a while, so let's talk about this simple skirt pattern by Small Dreamfactory that has the potential to be a great stash/scrap buster. It's a basic little A-line skirt style consisting of two pattern pieces: a front/back piece and a waistband piece. The author of Small Dreamfactory has published two blog posts relating to this skirt pattern which feature slightly different instructions, depending on if you intend to use knit or woven fabric (more on fabric choices in a bit), however the actual pattern files are currently accessible via the woven fabric post only. Thanks to Small Dreamfactory for sharing this pattern and their hard work for free. The sizing range spans Newborn to 10Y / Euro sizes 56 to 140 (which relates to the child's height in centimetres). The sizing has been split into three documents: Newborn to 9 months, 12 months to 6Y, and 7Y to 10Y. I used the size 5Y with the size 6Y length for Dolores (aged almost five in these pictures). So this is the confusing bit: this pattern is apparently suitable for both knit and woven fabrics (or 'jersey' and 'cotton' as they are referred to in the posts). I would definitely say it is more suitable for knit fabrics because I think it would be too tight if it were made in a woven: difficult to get on and off and potentially uncomfortable to wear. I reckon a nice, stable jersey would work well, as would interlock (which is what I used here). You could even go as thick as french terry or sweatshirt fabric, as long as it had a fairly decent stretch and recovery, but you'd probably want to use jersey or rib for the waistband. 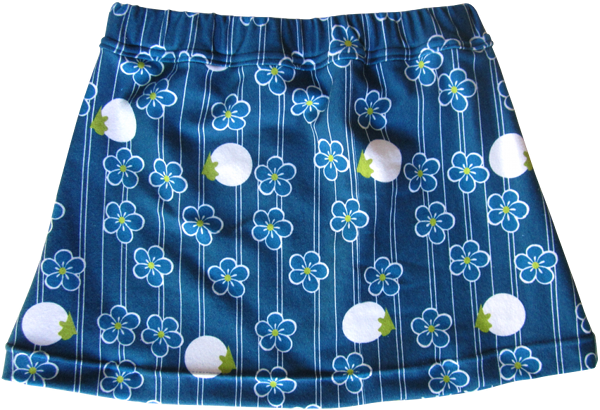 This is a lovely, basic, free pattern for making quick and easy little skirts, and because you add your own seam and hem allowances, the pattern can be printed on just two pages (for sizes Newborn to 6Y) or four pages (for sizes 7Y to 10Y). The instructions are brief, but illustrated, and take the form of a blog post so you can easily follow along on a smart phone. Personally, I used the instructions as a guide and veered away from the described method of attaching the waistband. For my version, I inserted the loop of elastic inside my completed waistband, then pinned and stitched the waistband to the top of the skirt in one go, then the three raw edges are neatened together. My method is quicker and less fussy, IMO, plus avoids having a visible row of stitching through the waistband which could look a bit messy if it wasn't done carefully. I also think it's worth emphasising that this pattern is for a really short style of skirt, and even though I picked a size up for the length, I'd probably lengthen this pattern further still for future versions. If I had a small amount of knit in a solid colour, I'd definitely consider making my daughter another skirt using this pattern. I appreciate that this pattern goes up to size 10Y, and could easily be graded out further still. Free patterns for older children as not as easily found as free patterns for toddlers and smaller kids, so I might keep it on the back burner for when she's grown out of a lot of the others.